“A penny saved is twopence clear,” wrote Benjamin Franklin in his now-classic Poor Richard’s Almanack, published annually between 1732–58. Franklin’s Almanack embodied — and perhaps shaped — the ethos of money in Colonial America. Today, we’re far from pennies earning more pennies. Heck, we hardly even talk about pennies after a century of inflation. These days, if you deposit money in a bank, you receive historically low interest rates. I’ll show you an astonishing chart in a moment. How bad are interest rates — for savers, at least? Look at the chart below, based on data going back to 1790. 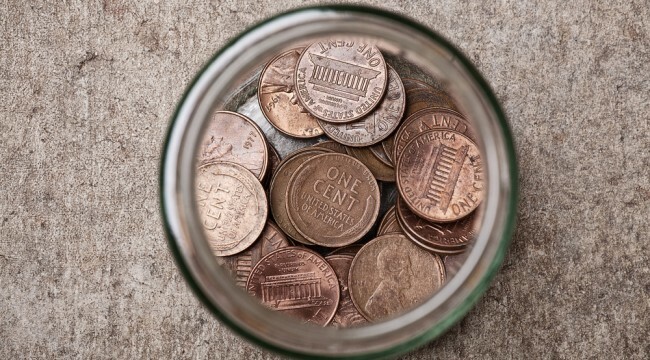 It puts a new spin on Ben Franklin’s old quip about a “penny saved.” A penny saved earned strong interest, back in Franklin’s day! Throughout most of U.S. history, you could “earn” decent money by following Franklin’s advice and saving pennies. For over two centuries, U.S. interest rates have seldom been less than 4–5%. Often, rates were higher. If you’d followed Franklin’s advice and saved pennies, you’d have earned decent returns over the long haul. Not anymore! In the past five years, interest rates have crashed below even previous rock bottoms during the Great Depression and World War II. How low is low these days? Let’s take a closer look, using a chart of interest rates over the past six decades, prepared by the Federal Reserve Bank of St. Louis. Just eyeballing the chart, you can see the 5% interest level running across much of the past six decades. Rates were lower sometimes and higher at other times. For example, look at how the fed funds rate spiked up strongly during the recessions of the 1970s and early 1980s, in a battle against inflation. But look at interest rates since 2008. Over the past five years, they plummeted. Where’s Ben Franklin when you need him? After the crash of 2008, the Fed dropped rates like a stone, and kept them down near zero. Savers suffer at zero interest. Down at the bank, you don’t even earn pennies on the dollar. The Fed and its principals know this. In fact, they know it and don’t care! Yes, and boohoo for you. If you’re a saver, Ben Bernanke feels your pain. But pain or no, the Fed has kept interest rates low, and that’s the plan looking ahead. Even worse, there may be more pain to come, because lately there’s talk of banks charging fees to hold your funds. That is, you’ll pay the banks, in a form of “negative” interest! In the brave new world of modern money, the Fed’s Ben has turned the other Ben — Mr. Franklin — on his head. Low interest rates rob the noble saver. The saver defers instant gratification, yet receives nothing for the effort. It goes against history. It ought to change, “one of these days.” But we’re stuck with this situation for now – even as we enter the Janet Yellen era. Along the way, it’s infuriating to do the “right thing” and save but then get kicked around for it. All that and, broadly speaking, it’s not so much individual savers who are harmed by low interest rates. Large-scale damage from low interest rates affects institutional money and pension funds. We’re not talking about “pennies saved” here. We’re looking at literally trillions of dollars of pension funds and such all seeking return. With low interest rates, many basic assumptions behind large-scale saving and future returns go out the window. Institutional and fund managers look ahead, run the numbers and foresee account deficits. Then? Well, then they change their behavior. Often as not, people do things inconsistent with long-term economic growth. Like what? Consider that at low interest rates, many individuals save more, borrow less and pay down debt. That’s good for the individual, perhaps, but slows the economy. Elsewhere, businesses divert funds from new capital expansion to bulk up pensions. Meanwhile, institutions beat up company managements to cut costs (often as not by laying off workers) and fund share buybacks. Fewer workers? Less capex? There goes the future seed corn for growth. Even governments bite the bullet. The political tendency is to raise taxes and/or scale back on, say, maintenance on infrastructure, while steering funds to undercapitalized pension accounts. At the Fed, policy honchos — welcome to the club Janet Yellen(!) — claim that low interest rates stimulate borrowing and spur the economy. So after five years of low rates, where’s the spurred-on economy? One can just as easily argue that low interest rates lead to less money going to concrete, steel and new machinery. If the past five years are any guide, economic growth is slow when interest rates are zero. Plus, low interest rates create large amounts of essentially “dry tinder” across the economy. That is, people and firms borrow simply for the sake of borrowing at low interest. It’s more fun to play with somebody else’s money, right? But looking ahead into 2014 and beyond, what happens when the business cycle turns and profits or incomes fall? How does the borrower service debt? Or worse, what happens when (not if) those interest rates go back up? Where’s the money? Well, I suppose that’s what bankruptcy court is for. Another investment alternative is dividend-paying shares. In these pages we cover numerous solid, well-capitalized dividend payers, from large oil companies to master limited partnerships and others. Meanwhile, we have to wait for the other interest rate shoe to drop from the Fed. My concern is what will happen when the markets sense the first signs of interest rates rising. Eventually, somebody has to pull that trigger and get rates back to some semblance of historical norm. On that day, expect heavy selling pressure as people book gains. We’re not there yet — even in the face of the taper, nobody is raising rates. For now, you need to appreciate the situation. As investors, we have to balance the need for return in a time of low rates with the risk of what happens when things begin to turn. Stick to those quality dividend payers. I’ll write about this much more as 2014 unfolds. Ed. Note: It’s important to safeguard your wealth in an era when savers are treated as economic pariahs. And the best way to do that is to stay informed. That’s why Byron contributes regularly to the Daily Resource Hunter – a service designed to help investors protect and grow their wealth in uncertain times… especially in the resource and energy spaces. Sign up for FREE, right here to get started.